Before 2004, Blockbuster was operating mainly using the physical stores throughout the country. In 2006, Blockbuster had 5194 stores through the country. 70% of the population was considered to be less than 10 minute of drive from a blockbuster store. Blockbuster charged about $3-$4 per rental for a fixed amount of time. The customer had to pay late fees if the title was not returned in the stipulated amount of time. More than 10% of blockbuster revenue represented the “late fees”. Only the high demand (majority of which comprised of newer tittles) were stocked. It was hard to find old, unpopular or independent films at the store. The economics of offering less popular films was not favorable. Blockbuster’s growth strategy was based on opening new locations to expand geographic coverage and increase market share. Increasing competition from Netflix, Redbox, Amazon on demand and other VOD services resulted in declining revenues for blockbuster (see Exhibit 5). The company filed for bankruptcy on September 23, 2010 wiping out more than $1B of debt. Some 54.8% of voters in a weekly poll said creditors shouldn't lend the company any more money, while 45.2% are still hopeful that Blockbuster will be able to rebound with more cash . Recently the deadline to file a bankruptcy and restructuring plan was extended till March 21, 2011. Blockbuster planned to close 72 stores by the end of 2010 and another 110 stores in the first quarter of 2011 . On the contrary, Netflix offered an online DVD rental service with no physical store location. Launched in 1998, the company focused on early adopters and offered only the DVD format even though the VHS cassette was prevalent at time of period. The widespread acceptance of DVD format was a presumption and risk for Netflix business model. Users could search through the collection and select the desired title. The DVD was mailed to the customer using the USPS service. Earlier, Netflix used the per rental charge model as other companies plus the shipping charges. However Netflix soon realized that it was spending $100 to $200 for a customer to make one $4 rental. As a solution, Netflix started the prepaid subscription based model. The new model allowed greater customer retention, turned the long delivery time to an advantage and most importantly allowed Netflix to offer “unlimited” DVDs per month. The new “all you can eat” model was an attractive alternative to the traditional per-day fee structure with late fees. A diagram of this system can be seen in Exhibit 1. The next hurdle Netflix faced was high demand for hit and new movies and the user frustration with the movie unavailability. The recommendation system was developed which makes suggestions of movies that are available and might be of interest based on preference and history. The success of the recommendation system decreased the demand for newer releases to 20% of the total demand compared to the 70% for the traditional video rentals. A positive “network effect” was generated from the large customer-generated rating system. As a start-up company, Netflix did not have any business relationship with major studios. Netflix mainly acquired titles from smaller studios at a minimal discount. Sarandos who had excellent relationships with the studios and was veteran in the DVD rental industry was successful in forming revenue-sharing agreements with the major studios. The average wait time when there was just one warehouse in Sunnyvale was about 1 week. The one day delivery model was very useful. Today, Netflix has 44 distribution centers across the country, which can deliver to more than 90% of 6.6 million subscribers within a single business day. Using optimized processes, Netflix’s employees could open and re-stuff an average of 800 DVDs per hour, allowing the entire distribution center network to ship over 1.6 million DVDs per day. The efficient and minimalistic work processes are part of their overall competitiveness (see Exhibit 4). Their operating cost in relation to revenues is less than half that of their competition Blockbuster (see Exhibit 5). In addition, Netflix collaborated with USPS, to further reduce the turnover time and cost. 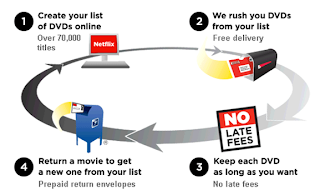 Netflix received a standard discount for presorting the mail by zip code. As Netflix became known as the de facto source for independent and foreign movies, the smaller studios were interested in partnering with Netflix to market their movies. In 2006, Netflix started to acquire rights for some independent movies through its Red Envelope Entertainment subsidiary. Another growing concern for Netflix was the high attrition rate (churn rate), which grew from 3.6% in 2002 to 6.3% in 2006. Athough, Blockbuster and Netflix compete in the same video rental market they really do different jobs for consumers. Blockbuster has made its core business the idea of a “movie night”. They assumed that most movie rentals were impulse decisions for people who want to watch a movie right now. These are usually new releases and so this is a majority of what Blockbuster stocks. Netflix on the other hand has evolved to view movie watching as a regular part of daily entertainment. They appeal to the customers who do not see “movie night” as an event but instead as an ordinary form of entertainment like watching television. The ability to hold movies longer and the convenience of receiving/returning through mail is perfect option for this type of consumer. So, Blockbuster and Netflix cater to two different types of movie renters. A Blockbuster customer would probably watch fewer movies but the ones they do watch would be new releases rented impulsively. A Netflix customer would watch movies more frequently. They would also be more interested in lesser-known films and would plan out their rentals in advance. Blockbuster and Netflix have differing business models and their operations strategies reflect it. As stated above, Blockbuster focuses on the “movie night” crowd who want a new release movie right away. So, they operate in a brick and mortar way where customers come into the store and leave with a movie. Their business model is to allow consumers to make an impulse decision to rent a movie and get it right away. To accomplish this they have an operations strategy of actual stores located heavily across the United States and stocked with mostly mainstream titles. Netflix on the other hand has created a business model around the idea that consumers want convenience and selection more than they want to be able to make an impulse decision. They then created an operations strategy to accomplish this. Monthly fees instead of rentals, mail delivery instead of pickup, and a wide choice of movies instead of just new releases are all a part of their operations strategy. It certainly appears that Netflix’s business model will win out in the end as shown by the stock price of the two companies in Exhibit 2 and 3. With the rise in availability of broadband Internet and Internet connectible devices, the video on demand business model has gained prominence. VOD is a pay per view ability to access any multimedia content to an individual Web browser or TV set based on user requests. VOD systems either stream content through a set-top box, a computer or other device, allowing viewing in real time, or download it to a device such as a computer, digital video recorder or portable media player for viewing at any time . I will bet short on Netflix unless, it starts VOD for “all” of its titles available. Netflix offers “some” select few titles for online viewing but this will not be enough in the future. Allowing users to watch any movie they want right away would be an enormous strategic advantage for Netflix. This would obviously take some negotiating with the other entities in the movie business. The DVD makers would be strictly opposed to this but if the price was right a deal could surely be made. In addition to expanding their selection of VOD titles, allowing playback easily on televisions will also be important. If a consumer owns a 50” HD television they are not going to want to watch a movie on their computer, even if it is being watched “on demand”. So, giving playback on internet enabled televisions (all brands) is going to be an important step towards winning the VOD battle. Another Netflix disadvantage is the limited TV programming available to watch online. Services like HULU Plus offer a huge collection of high definition TV programming. The free HULU service is also available to view limited TV programming. While it may be hard to work out deals with the movie studios, working on deals for television shows (both past and present) seems easily possible. Also, a customer would be more willing to sit and watch a 30 minute television episode at their computer where as they might not be willing to do the same with a 2 hour movie. This eliminates the struggle to get VOD onto televisions and is another reason that focusing on “on demand” television show viewing could be arranged rather soon. Even though they are currently struggling, Blockbuster, has started the “Total Access” service. The Total Access service allows the customers to order and return titles via mail, second, order and return the title at participating physical store, third, rent or purchase movies online on-demand. In addition to the movies, Blockbuster also offers access to Playstation 3, Xbox 360 and Nintendo Wii games at no extra charge. According to PwC, the video game industry will grow at 6.7% compound annually for the five-year period to $12.5 billion. It has already surpassed the music spending from the consumer spending point of view. Therefore, the offering the video game with movie DVD and blu ray disk can be vital factor for success. Blockbuster has also started to set-up vending machines at local grocery stores and gas stations. For newer titles Red Box has been the preferred service in the recent times. Red box vending machines can be found in the everyday grocery stores like Kroger, Wal-Mart, Biggs etc., Pharmacies and even local markets. Red box offers convenience of reserving a movie through the Internet (an iPhone app is also available) to avoid the inconvenience of not finding the movie required. As of April 2007, kiosks had averaged 49.1 rentals per day and $37,457 a year in revenue . Redbox is the cheapest movie rentals, which charges $1.00 for a DVD and $1.50 for a blue ray disk for one night. Redbox allows the customer to return the rental disk at any location. In addition to the rental business, customers also have the option to purchase the disks from the Red box vending machines. Other VOD providers like Qriocity have exclusive connectivity with Sony, which is a major player in the HD TV market. In short, Netflix has some stiff competition in the days ahead. Source: Netflix Business Model, White Paper; Coates A., Deshpande A., Lopez N.
I love Blockbuster, and with them reducing there prices there is no question about who I will choose. With Blockbuster you get thousands of movies for only 99 Cents. Alongside the 99 cents, they are launching single day pricing that lets customers decide how long they want to keep their movie. They even release new movies 28 days before Netflix does. Right now Blockbuster is actually offering a promotion where customers can receive unlimited movie rentals for free in the stores through July 4. Working at DISH Network I can tell you if you switch over to DISH you can get Blockbuster free for 3 months. You get unlimited movies, TV shows, and games through the mail and 5 in-store exchanges per month. With DISH Network you great deals and offers. Go to this link to check out more http://goo.gl/wuMrN . I think that Blockbuster has so much more to offer for the money you pay. Blockbuster is my choice, because with reduced prices they are offering good quality. After this evaluation no further choice is left. Hi..I am extremely impressed with your writing skills as well as with the layout on your blog.and This is very interesting, You’re a very skilled blogger.Thanks for sharing..this article. instagram online viewer I read your post and I found it amazing! thank! instagram online I am hoping the same best effort from you in the future as well. In fact your creative writing skills has inspired me. https://www.yttomp3.org Very awesome!!! When I seek for this I found this website at the top of all blogs in search engine.